In our first article, I explained my needs/wants for the alarm clock and ended up selecting the Elgin 3350E shown above. 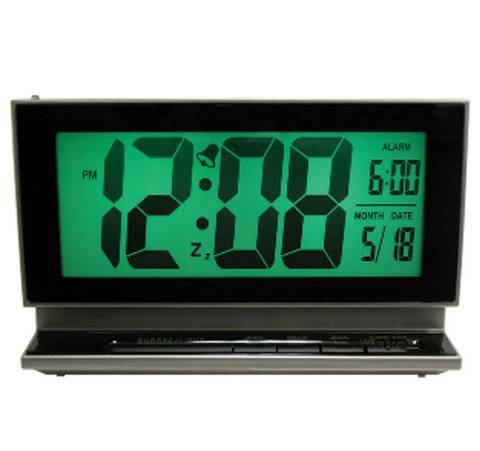 It is a battery powered alarm clock with an automatic back lighting feature. If the room is lit up by the sun or by lights, the clock turns the back lighting off to save on battery life. However, once it gets dark in the room, it turns the back light on so you can see what time it is. It also has some pretty good reviews on amazon and it is also pretty inexpensive. The clock requires 3 AA batteries. The batteries I will be using are what you see above. They are some nimh rechargeable batteries I nabbed from the local harbor freight. Any nimh battery will work, but you may have to change what solar panel you use according to what batteries you have to use in the clock. This is a great bit of info for us. It contains basically everything we need to figure out our solar setup. Prepare yourself for a little math and electronics speak as we delve into the world of charging batteries. The batteries I am using are rated at 2200 mAh. The quote above says I can charge them at C/10 safely. C is the battery capacity which is 2200 mAh. This simply means that I can charge them at a rate of 2200/10 = 220 mA. So, I want to find a solar panel that puts out 220 mA or less to avoid doing any damage to my batteries. This is great news because it means I don’t need a charge controller or any additional circuitry to complicate things. The next step is figuring out the solar panel voltage. Again, we’ll look at the quoted paragraph that says we need at least 1.41V per cell. Well, the clock is using 3 batteries, so we need to provide 3 x 1.41V = 4.23V. Unfortunately, you can’t just go out and buy a 4.23V solar panel. However, 5V and 6V panels are readily available. Either of these will work, but we have to figure out a way to get them to put out 4.23V. I ended up purchasing the solar panel you see above from ebay. It is rated at 5V output and 200 ma. A 6V panel that is rated for 220 ma or less would work just fine too. But, we still have to get the panel’s voltage down to 4.23V. To get this voltage drop is actually quite easy, and it is going to be done by another component we need for the solar setup anyway. That component is a diode. It is essentially a one way / check valve for electronics. The diode is not only going to provide a voltage drop down to 4.23V, but it also stops the solar panel from draining the batteries when the sun isn’t shining on them. All solar panel setups use these, and you can get them with different voltage drops. To get the diode, I went to digikey.com. They have an insane amount of electrical components and shipping is pretty cheap too. This is the diode I selected if you want to use a 5V panel like me. It will provide an approximate voltage drop of .75V giving an output of 4.25V which is close enough for this application. Alternativly, if you wanted to use a 6V panel, this diode should work fine for you. It has a 1.75V drop and will give you a similar 4.25V output. Once I get all these things in the mail we’ll start putting them together! For the latest info and a bit more detail, see the forum thread. You need to be aware of the way that solar panels are specified. They are mostly rated for the power they will produce in FULL SUN when facing DIRECTLY at the sun. (This is known as STC – Standard Test Conditions). The thing is that in the real world panels rarely, if ever are facing directly at the sun as it is always moving. As the sun moves off-axis, the output power (voltage mostly) will fall off in proportion to the angle. So I think you may have under specified the solar panel – this is a common mistake. I would use one rated for a much higher voltage – say 9-12 Volts. This will not damage the battery because the current is so low. Thanks for the input Guy. This is my first project with solar panels for small electronics. We’ll see how it works out and I’ll be sure to report back. I still think it will probably work out alright though. Even if the panel doesn’t keep the batteries at full charge its not a big deal. Nimh chemistry doesn’t have issues with sulfation like lead acid does, so maintaining a partial charge is fine. The panel just has to keep them from discharging to the point where the clock can’t use them. Wouldn’t you agree? It will really come down to where the solar panel is located. If it is inside a window in your home there will be losses from reflections and then add in the shading from trees or buildings and you may not have as much power as you need to maintain a minimum replenishment. The rule-of-thumb with any solar application is to clearly define your consumption and then design an optimal solar solution that can fully replenish the usage in a real world environment. … also for any real charging to occur, you need at least 2 Volts MORE than the rated battery voltage. Preferably 3 to 5 Volts more. Anything less will simply not charge the battery at all. Thanks again for the information Guy. I just got the clock the other night, so I’ll be testing power consumption on it shortly. The solar panel has yet to arrive, but I’ll test it out once its hooked up as well and report back. Another thing I noticed when looking at the diode datasheet is that the diode voltage drop is not static. At lower current levels, the diode has a lower voltage drop. At 10mA the forward drop is only .4V. At 50mA it is .5V. This isn’t a huge benefit, but it is something. I tend to use a Schottky diode in all solar applications because it has a MUCH lower voltage drop ( voltage drop is between approximately 0.15–0.45 volts). I suggest an SB160 that is rated for up to 1 Amp. This way you get more bang for your solar buck.